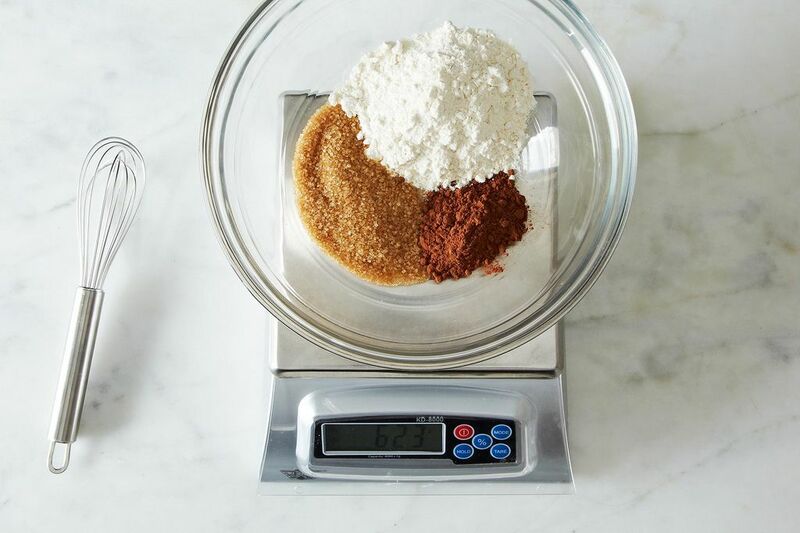 Today: Alice shares how to make sure your scale is in tip top shape for perfect baked goods. Now you have a scale (right?) and you are wondering if it’s really accurate. You could just weigh a 4-ounce stick of butter (or a pound or a kilo) to see if the scale is in the ballpark. If it’s close enough, you may be satisfied -- after all you’re a baker, not a rocket scientist, right? On the other hand, if you weigh small quantities, like salt and leavenings, or if you just believe that a tool should do what it’s supposed to do, read on. You could use calibration weights (purchased online) to check your scale’s accuracy, or you can use ordinary pocket change. I vote for the pocket change (and instant gratification). 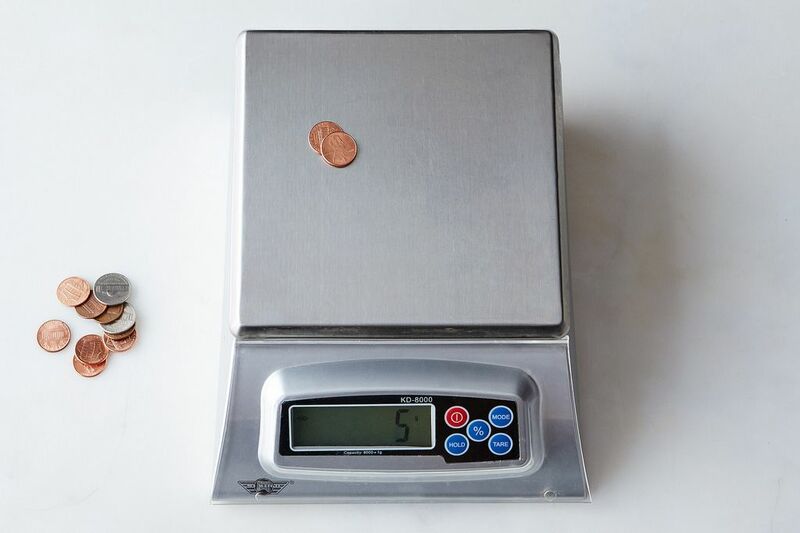 Set the scale to zero and weigh a coin or two: A new penny should weigh 2.5 grams (see note below), 2 pennies should weigh 5 grams, and a nickel should also weigh 5 grams. Don’t worry if your coins are not fresh from the mint, but don’t use any that look really old and worn -- when in doubt, try more coins before deciding your scale is off. If a coin or two weighs the correct amount, you can stop there. But those of you who just can’t give it a rest might also like to weigh a whole handful of coins just to make sure accuracy is maintained. Note: Only scales meant to be accurate to .5 grams (or less) will register the correct 2.5 grams for a single penny. If your scale is meant to be accurate to only 1 gram (like mine), the weight of a single penny will be rounded up to 3 grams. Stay calm and add a second penny: If the two pennies weigh 5 grams, then all’s right with the world. More: Not convinced? Here are the many reasons using a scale with change your life. The exact weight that a scale reads is not so important, when making a recipe, as its linearity. If the scale does not read the correct weight at any load it can still be linear. This means if you are incorrect for one ingredient you will be equally incorrect for all of the ingredients. So unless a scale is way off ( a pound of butter should be close to a pound) the scale is OK for recipes. All of your ingredients will be more or less than specified and you will have a slightly larger or smaller batch but it should come out right. This is hilarious, and it works. I spent a lot of money buying a calibration weight, so I am passing this on. Or, use water and a measuring cup. A fluid ounce of water weighs an ounce*, or 28.4 grams. A cup weighs 8 ounces. * Too be precise, a fluid ounce of water at room temperature weighs 1.04 oz. I too, have that very same scale. I bought it for work at the restaurant, and have been very happy with it! Except that I paid $73 Canadian! Oh well, it works like a dream, so it was well the price to me. Sorry, "well worth" the price. At work we calibrate " test" our scales daily. The exact span (reading at full load) of a scale is not so important, unless your scale is used in a legal-for-trade application (the amount paid for something is affected) or it is used to measure amounts to be used later or with other scales. But it is good practice to check a scale regularly. If the proportionality of different amounts weighed on the scale is critical it should be checked at different weight levels to be sure it is linear. This can also be accomplished without accurate weight references. I will explain this if you would like latter. I love baking using my scale and frequently, when time allows, make my own margin notes on weights so there's no future need to mess with measuring cups/spoons. I wish everyone used gram measurements -- not ounces -- in the recipes they provide; am keeping my fingers crossed we get there soon -- yes, even in the U.S. (and even laid-back L.A., no less). Thanks so much for this information! I've always wondered if my scale was accurate (I have the same one that's pictured) . . . turns out, it is!! what kind of scale is that? It's a My Weigh KD-7000, $33.92 on Amazon. i have that scale too and it's lasted me years! definitely worth it! I have used my My Weigh scale, a KD-8000, for 4 years, and it is great. I recommend it. Its digital read-out is easy to read, the buttons are easy to manage, and it is easy to wipe down. I especially like the tare feature, which I guess all modern scales have. It switches easily from ounces/pounds to grams/kilos and back again. At its price, it's a good value. The "8000" in its name indicates that it weighs up to 8 kilos. Only if the Pennies were minted after 1983. Pennies minted prior to 1983 have more copper and are heavier.